Sources have reported that the Tennessee Titans have signed Jurrell Casey to a four year contract extension worth $60.4 million. Casey is coming off another strong season where he was PFF’s 10th highest rated interior defensive lineman (4-3 DTs + 3-4 DEs) with an overall grade of 87.1 in 2016. His run stop percentage (8.2%) and pass rush productivity (8.9) both ranked in the top-10 for his position. 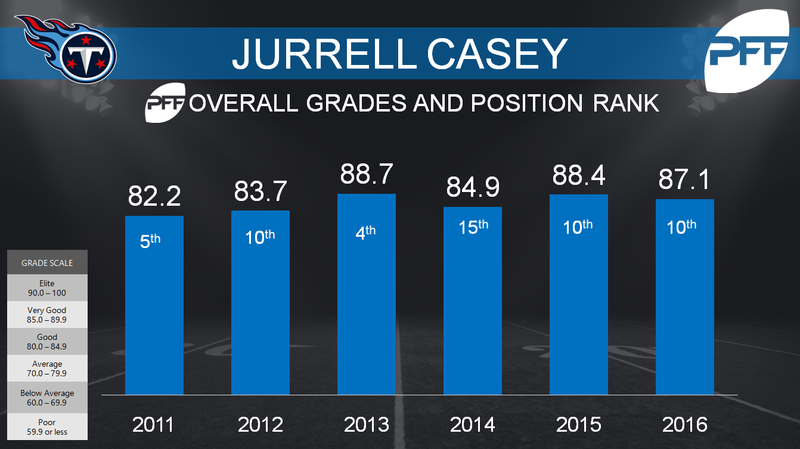 Casey has been remarkably consistent and durable throughout his six year NFL career, missing only 2 games and posting a grade of at least 82.2 every season. In fact, in Casey’s last four seasons he’s produced QB hurries at an almost mechanical rate (36, 31, 36, 36), placing him in the top-11 per season amongst defensive interior lineman.